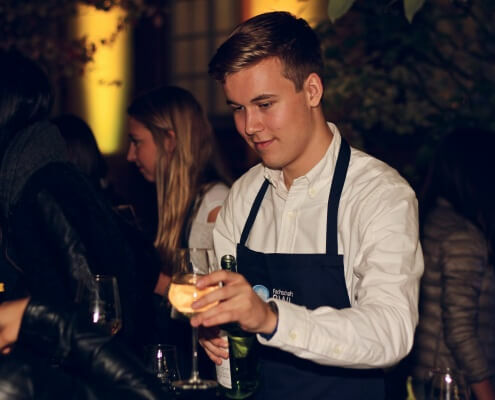 Twice a year the student association of the business students host JAZZ IM SCHLOSS in the elegant setting of the Mannheim castle. Enjoy a glass of wine with us and let the live music and the comfortable atmosphere take you on a journey. Since 2008 this unique event by the student association unites not only professors and students, but also university staff and external guests in order to delight them with beautiful jazz music. We invite you to spend an unforgettable evening with your colleagues, fellow students and friends. Obwohl ein Sturm mit Gewitter den Aufbau im Schneckenhof anderthalb Stunden vor dem Einlass komplett zerstörte, kamen die Gäste von Jazz im Schloss auf ihre Kosten: Die Veranstaltung wurde spontan in die Katakomben der Universität verlegt und so konnten die knapp 600 jazzbegeisterten Zuhörer den Auftritt des College Jazz Orchestras doch noch genießen.